This last week has been a bit crazy. We moved apartments (for the third time this year) in Stockholm – and luckily our new one is for a year, complete with Kasper our new pet cat, while his owner works in the Congo. Note my wreath plant – a featured item in every Swedish home – my orchid (another pre-requisite) lives in the kitchen. This week has also included two trips to the Migrationsverket (The Swedish Migration Board) to have my biometrics taken for my new residency permit. You normally only have to go once – however on my first trip I forgot to bring my new address with me, and as luck would have it, my phone was sitting patiently at home on recharge, so I wasn’t able to call Geoff to ask him. So back I went the next day. The Migrationsverket was actually very simple and quick to navigate. It opens at 9 am, so I arrive at 8.45 or so, joined the end of the queue (there were about 30 people before me) and at 9 am we were allowed to take a ticket (ticket machines are a popular feature just about everywhere in Sweden) and only 15 minutes later I was called up to have my biometrics taken – a finger print, my photo and height, all over in 10 minutes or so. Now on Friday, only 4 days later, I have my new residency permit! That said, Geoff is still waiting for his and he had his biometrics taken 2 weeks ago, so I suppose it depends on who is processing it. Now we are one step closer to the elusive personnummer! One we have that, the world of Sweden will open before us! Well… at least we will be able to order things online from IKEA. So a great start to a weekend that involves a trip to a Christmas market at a castle and a friend’s housewarming party. Love your new apartment. It looks very cozy and well, Swedish 🙂 I can’t believe you’ve had to move so much. You must be a pro at packing! I’m happy for you that you’ll be able to stay put for at least a year. 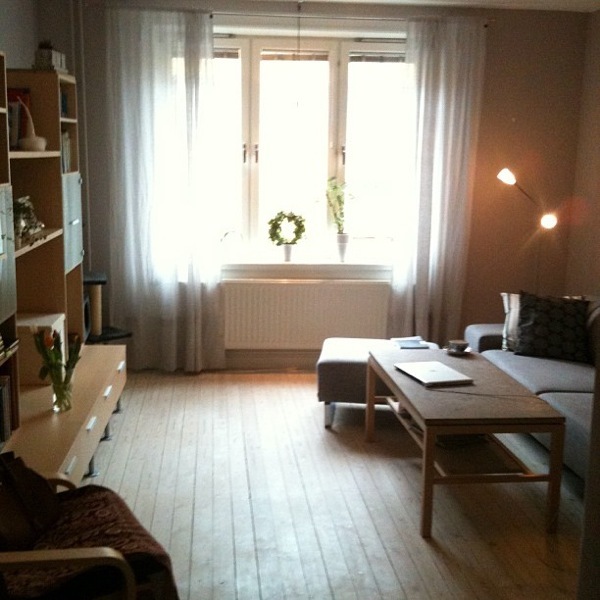 Melissa, I’m going to make a post on finding accommodation in Stockholm, because you can’t imagine the craziness involved in finding a place to live here. I have a friend that moved 10 times this year… it’s because there is a government queue system and you need to be on it for about 10 to 12 years to get a first hand rental contract close to the city center… so everyone rents second hand, and has to move all the time. Oh, ticket machines! I remember having to take a ticket at a chocolate shop/café even though there was only one other person being served. The wreath plant isn’t alive, is it? It’s crazy Wendy – even at the tourist information with 3 people behind the desk, and no other customers, I had to take a ticket before anyone would talk to me. The wreath plant is real! It’s hard to tell in my terrible iPhone picture, but it is a wreath of ivy, wrapped around a circular frame. Very popular here to grow all sorts of plants in a circle… I think you are asked to leave Sweden if you don’t have one in your house! Is there something like that where you are living in France?